We still have a glut of zucchinis. By the end of the summer, I’ll have figured out a dozen variations on zucchini muffins. Heck, maybe I’ll even try putting summer squash in cookies. 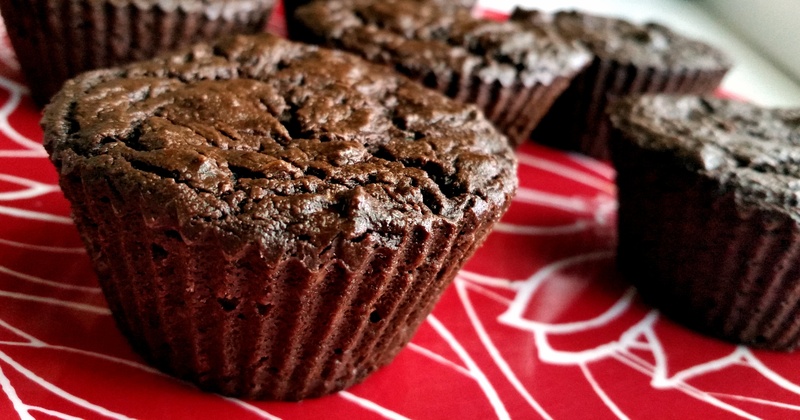 These muffins are moist, fudgy and extremely chocolatey. The lack of gluten makes them a little more delicate than a grain-based muffin. Enjoy! In a blender, puree 1½ cups of the zucchini, the flax seed, coffee powder, vanilla, and oil until smooth. In a bowl, mix the flours, cocoa powder, salt, baking soda, baking powder, spices, and xylitol or sugar. Add the remainder of the zucchini (2 cups grated zucchini) to the flour mixture and mix until well blended. Bake about 30 minutes in a 350°F oven. Muffins are ready when inserted toothpick comes out mostly clean. They're a real treat. Really wonderful with my afternoon coffee. Thanks! If you get a chance to bake them, I'd love to hear how they turn out! Wow Kathyrn, another tempting muffin recipe - I can't believe how much cocoa powder is needed! Well, I love my dark chocolate. But if you want less you can substitute part of the amount with flour. If you want to keep it gluten free, I'd sub buckwheat or GF oat flour. Otherwise you can use regular or whole wheat flour. Thanks Kathryn for the tips!